The Maestro Wireless® unit does not require neutral wire for installation. 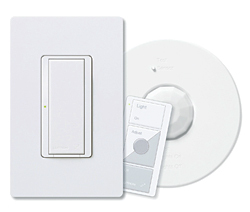 It functions similar to a standard switch, but it can be controlled by Pico® wireless controllers and Radio Powr Savr® ceiling-mount occupancy/vacancy sensors. Technicians can install the non-neutral unit in single-pole or multiple-location applications.